What if Gods were powerful aliens? That is the theme of Star Gate. What if God is a super intelligent computer? That is the theme of Orson Scot Card’s Homecoming. The story starts on a modern planet in the future where society is developed with women being the rulers. There everything begins to collapse, and the main characters have to return to earth which is the homecoming referred to in the series. This is both to escape destruction of their world and quest to unite the computer called over soul that governs the planet with its counterpart on earth ‘The Keeper’. This is probably some obscure allegory of the journey of the soul to become one with its maker. The whole nature of society changes with the changed circumstances. In the face of crisis, the fleeing band, for the sake of survival under adverse circumstances, turns into a patriarchal society of the Biblical times. In some ways the author tries to explain how the needs of the times necessitated some of the undesirable ways of some of the people before us. Of course, people who see Orson Scott Card as a rabid right-wing fundamentalist may see his attempts as nefarious designs to justify the unjustifiable and give a pseudo-scientific facade to unscientific nonsense. But the way I see it, there is a big difference between understanding something and accepting something. Anything good or bad happened for a reason. Even if you want to eliminate the bad or prevent it from recurring, it is very important to understand why it happened the way it happened. As Sun Tzu says one needs to understand oneself first and then one’s enemy to be able to win a war. On similar lines, I feel it is very important to get a sympathetic understanding of things that one is opposed to instead of blindly closing one’s eyes and trying to shoot them down wherever they are seen. That kind of blind attacks on opposing views by rationals is them adopting the ways of the fanatic, transforming the rationals into exactly that which they are opposed to with the label being the only difference. The tale at its simplest level is a conflict between two brothers – Nafai and Elemak. This struggle between the brothers is a constant theme one sees in all of Ender’s series – Peter and Ender in Ender Series, Calvin and Alvin in Tales of Alvin Maker and here between Nefai and Elemak. As the series progresses, he makes the tussle between the two brothers the tussle between two different ideologies within a religious group. One would expect a writer with religious affiliations make the heretics and non-believers the antagonists. But usually Orson Card tries to bring out the positive aspect of religion and negative aspects of religion and the antagonists usually represent the negative aspects of religion. From what I have talked about so far, it might look like the book would be a dry, boring theological parable. But that is not at all the case. While these things do exist as undercurrents, the world building is very imaginative – the original cities of the future, the group in the spaceships travelling towards the earth and the world on earth itself. When the humans arrive on earth they find earth populated with alien beings – intelligent beings that resemble bats and mice. The symbiotic relationship between these two beings and the impact of the arriving humans on the same is also fascinating. Then humans have to multiply and establish a society on earth along with these beings that have made earth their homes in their absence. The humans split into Nefaites and Elamites under the two brothers and the final show down occurs not between the two brothers themselves but their respective people thousands of years after the demise of the founders of the two communities. The characters in the story are all interesting and unique. Except for Nafai, most have shades of grey and the interplay between the various characters presents lots of drama. For example Elam is not pure evil and we are shown how circumstances change him that way. Yet he has an important role to play. So the story doesn't become all about him being defeated by Nafai. We have the two step sisters of Nafai and Elam, who are initially shown as totally despicable beings but manage to redeem themselves in the later part of the story. We have a totally soft character turning out to be a psycho killer. So we have all these kind of dynamics within the limited society. 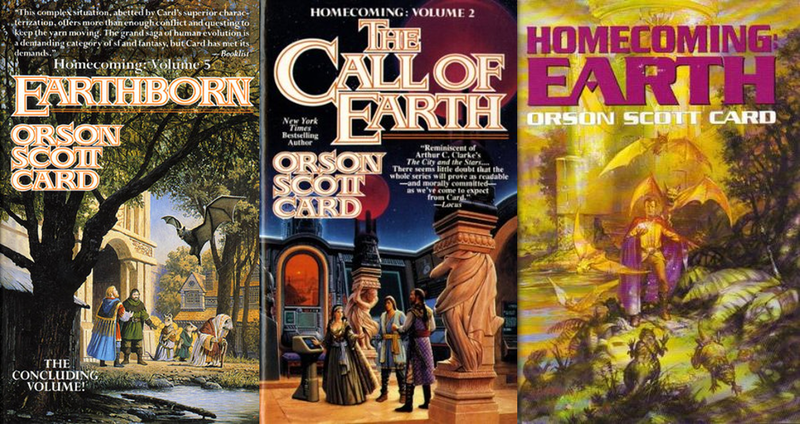 As always is the case with most Orson Card series, the ending was a bit disappointing. Card creates wonderful worlds, sets up really interesting conflicts that holds the attention of the readers, creates some really interesting characters and finally brings all these to a flat ending that is full of moralizing when the reader is expecting a grand finale. But overall definitely worth a read for the author’s imagination to build a science fiction story that reads as if it is right out of the Old Testament. The interesting alien race is an add on.